Just as players prepare for a game before each puck drop, it also signals the time that officials should be getting game ready. Before arriving at the rink, referees need to start their preparation so that they hit the ice as ready as the players. All referees should take out their equipment bag and completely review all equipment and its condition to ensure it is game-ready. Items such as jerseys (with appropriate cresting), helmets, visors, neck guard, whistles, pants need to be inspected, and repaired or replaced where necessary. The most critical item for officials is your skates. Make certain that fit, sharpening, and general condition are all to the highest standard. Many Officials also keep items such as extra whistles, spare laces, measuring tape, skate sharpening tool, tape and stick gauges with their gear. Your arrival at the rink is not the time to discover some of your equipment is in disrepair or in need of replacement. Officials will also keep a copy of the Rule Book in their bags - take the time to refresh and do a rules review during the season. Another key item that all Referees should update and ensure is in their bag at all times is a medical information form, which can be critical in providing information to those providing care to you in case of illness or injury. 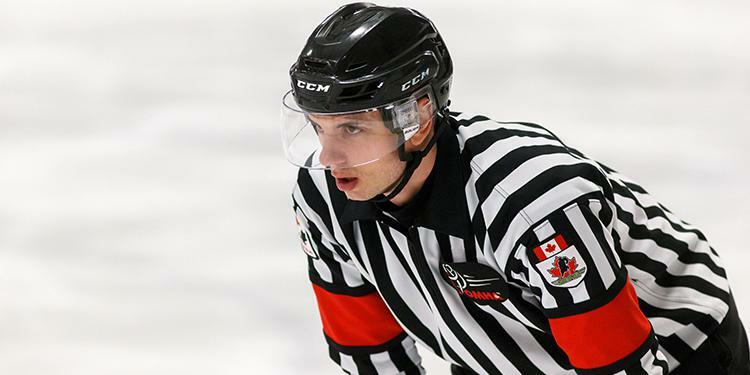 Referees should also be aware of who their Local Referee-in-Chief and Assignors are as well as OMHA Regional Directors, Convenors, and area HCOP Supervision personnel. It goes without saying that fitness should be a year-round pursuit for all of us as part of a healthy lifestyle. Conditioning is important to all officials, as your conditioning needs to reflect the level of hockey you will be officiating. The minor hockey official does not typically attend a pre-season camp like the Junior Hockey Official, so it is the responsibility of each official to ensure they begin the season physically and mentally prepared. Similarly, pre-game stretching also forms an essential part of your preparation. A referee needs to be skating and performing at the same level as the players they are officiating. Throughout the season Officials can reflect on the expectations and goals that were set and identify growth opportunities, challenges and set out with enthusiasm on the path to achieving them.